Does A More Expensive Speaker Cost Mean Better Sound Quality? →Does A More Expensive Speaker Cost Mean Better Sound Quality? Does A More Expensive Bluetooth Speaker Cost Sound Better? Music is like the soundtrack of our lives. But how much are you willing to spend on it? Does a high-priced speaker cost mean better sound quality? Do you spend the bare minimum just to get your tunes or do you go overboard to get the best possible sound? Is it really worth it to spend more? Is there any difference between a $50 Bluetooth speaker and a $10000 speaker? More importantly, is that difference worth it? Generally, the very best products are always costly. Sure, once in a while you may come across affordable products that perform remarkably well, but nothing comes close to what a truly high-end product can offer. Beyond the price tag, high-end brands offer an exquisite combination of style and performance. Unlike typical products, they use the best raw materials available. So, therefore, is it true that a higher-priced speaker cost mean better sound quality? Today, most audio companies hardly try to make the best sound gear. They understand that styling, wireless connectivity, affordability, compact size, marketing, and distribution are more important for huge sales. There are so many affordable Bluetooth speaker brands that are pretty decent, but very few are outstanding. What Goes Into Making a Speaker? If you take modern speakers apart, you will find the same components. This is because, regardless of their price, they work pretty much the same way – they use magnets to translate electrical signals into audible sound. Chassis or housing: This holds everything together in a neat casing. Surround: This is the front material that connects the chassis to the cone. Suspension and cotton spider: They keep the voice coil in place. Front plate: It is used with the magnet and yoke to create a full magnetic circuit. Dust cap: This prevents external particles from getting into and damaging the voice coil. So, does speaker cost mean better sound? No matter the cost, here are some of the factors that differentiate a high-quality wireless speaker from a not-so-great one. Loudness is like the horsepower of a speaker – it’s a very important consideration especially if you like loud music. Check online reviews or with the audio company about how loud a speaker is. Also, ensure you check the frequency range. Good speakers should deliver frequencies between 1000Hz and 20,000Hz. If you are shopping for a new wireless speaker, it is always recommended to personally go to the store and check how the speaker sounds at peak volumes. Most times, even the very best speakers have some slight distortion at high volumes. The best way to find the best one is sampling multiple speakers and finding out which one among them has the cleanest sound. Good speakers should have separate bass radiators. This allows them to deliver powerful bass. As a result, you will get well-balanced highs, crisp mids, and clear lows. So before buying a speaker just because of its design or color, check how it delivers audio. Speakers have always been known to be pristine instruments. But with the advent of activity-oriented wireless speakers, you should now opt for more sturdy and durable speakers that won’t get damaged easily in case of an accidental fall or water spill. You wouldn’t want a Bluetooth speaker that runs out of charge quickly, would you? Battery stamina is crucial for a portable speaker. A reliable speaker should last for more than 12 hours of playback. Good Bluetooth speakers should exhibit a multi-unit pairing feature and should flawlessly remain connected to a source that’s at least 30 feet away. So, You Need to Spend a Lot of Money on a Speaker? And Does High Speaker Cost Mean Better Sound? 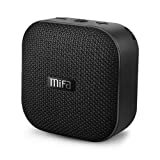 Today, there are a number of affordable Bluetooth speakers that come with an array of stirring features such as long battery life, easy portability, water resistance and more, that offer an incredible sound experience. Most times, Bluetooth speakers are expensive just because of their brand name and nothing else. But this doesn’t mean that all cheap speakers perform as well as their costly counterparts, some are just a waste of money. It’s up to you to go speaker hunting and find the best speaker that can produce excellent vocals, bass, tremble, and mid-range sound without compromising on durability. All in all, how you enjoy your sound is entirely up to you!